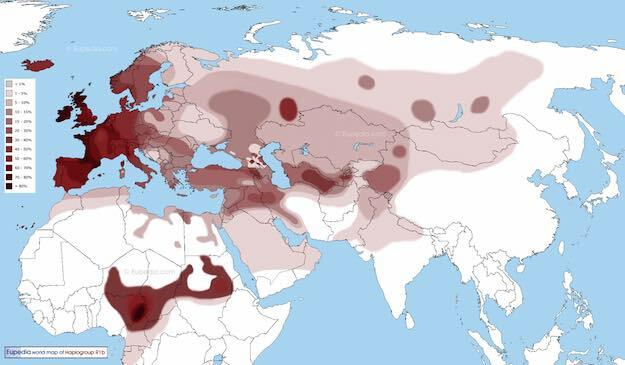 Whenever you look at a map which shows the distribution of Y chromosomal haplogroup R1b you see two areas where the frequency seems very high. First, Western Europe has a very high frequency. Before 2010 it was commonly assumed that R1b was the heritage of late Pleistocene European hunter-gatherers. Around 2010 deeper analysis suggested perhaps that this was not so, and that the deepest divisions in the phylogeny of Eurasian R1b could be found to the east. The high frequency of this haplogroup then may have been an artifact of the Holocene. Ancient DNA has confirmed this hypothesis. The high frequency of R1b in Western Europe seems to date to the Bronze Age. Though R1b is not found exclusively in Indo-European peoples and existed at low frequencies in Pleistocene Europe, its current ubiquity in Europe seems likely related to demographic turnover between 3 and 5 thousand years ago. If I had to bet I think R1b, like R1a, originates among the North Eurasian people who mixed with West Eurasians and Amerindians. 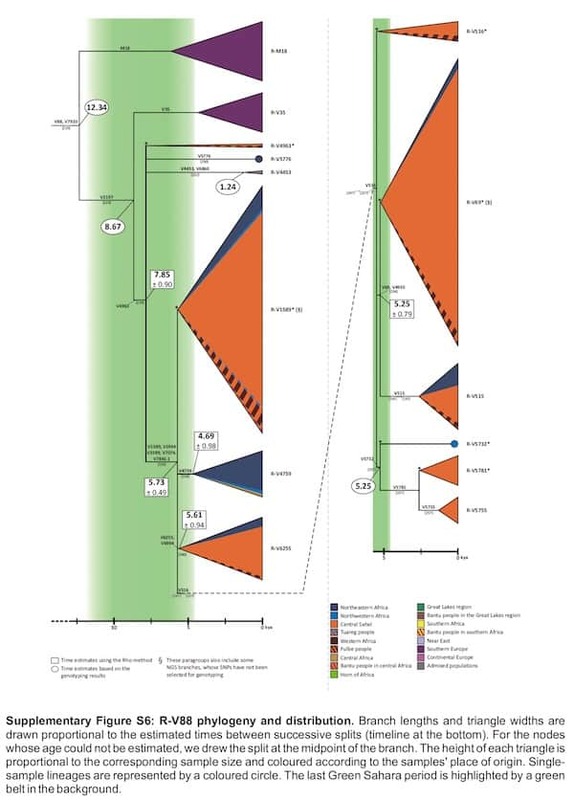 The Ma’lta boy, for example, seems to have been a basal R.
A new paper, The peopling of the last Green Sahara revealed by high-coverage resequencing of trans-Saharan patrilineages, really gets to the origin of R-V88, with a massive Y data-set. There’s a lot of other Y lineages that are surveyed in this work, but in the supplements, the figure makes it clear that Sardinian R-V88 is basal to star-like African topologies. The implication here is that the African lineages derive from European ones. The autosomal paper found Chad populations (though the one in question was not Chadic speaking) seem to share drift from Sardinians in particular. 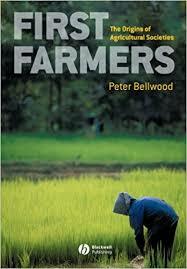 Looking at ancient genomes Early European Farmers seem to have been the primary donor population. 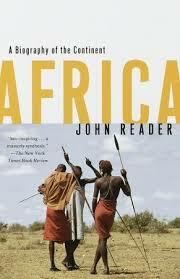 Additionally, the coalescence of the African lineages seems to date to 5 to 6 thousand years before the present. 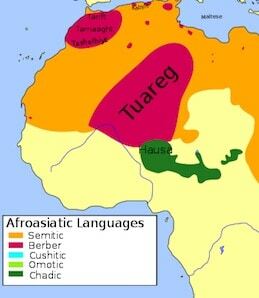 Though not definitive, the association of Afro-Asiatic populations with R-V88 is strongly suggestive to me of the possibility that some western Near Eastern Farmers spoke Afro-Asiatic languages. Seven years ago I wrote 1 in 200 men direct descendants of Genghis Khan. It’s the most popular post I’ve ever written. As of now there have been 630,000 “sesssions” (basically visits) on that page alone. I suspect that many more have read my summary of The Genetic Legacy of the Mongols, the original paper on which it was based, than that paper (though it’s a good paper, you should read it). At the time I wrote that people often asked me if I was a descendent of Genghis Khan. That seems unlikely on the paternal lineage. My Y chromosome is R1a1ab2-Z93. This is typically found in South Asia, and among Iranian peoples, as well as in the Altai region of western Mongolia. It is not common among Mongols though, even if it is found amongst them, likely due to gene flow from the west. The particular branch of R1a1a that I carry has been found in ancient remains from the Srubna culture of the eastern Pontic steppe. As a friend of mine might say, I am the scion of marauders from the steppe, even though not Genghiside ones. The fact that I have the last name Khan is simply a legacy of the custom whereby South Asian Muslim lineages of a particular status accrued the surname to denote their position within Islamicate civilization. But though I am no direct descendent of Genghis, it turns out that my Y chromosome shares a similar history. The figure to the left is focused on European Y chromosomes, and at the top you see various “R” lineages. It turns out that R1b and R1a are both basically subject to the same explosive dynamics as the Genghis Khan haplotype: both exploded into star phylogenies relatively recently in time. Trees of the R1 lineages always show them to exhibit a rake-like pattern. This is due to the fact that starting from a small base they expanded so rapidly that they did not develop the intricate node-structure you see in lineages which accrued mutations at a more normal pace. What could have caused such explosive growth? We know why Genghis Khan and his sons left so many descendents: conquest yielded social status. For many generations having a male Genghiside bloodline was highly effective as a means to gain bonus points when attempting to scale the summits of power and wealth. This was even true in the Muslim regions of Central Asia, despite Genghis Khan’s negative impact on Islamic civilization (Transoxiana arguably never recovered from this period). We don’t have anything like the “Secret History of the Indo-Aryans” to explain the emergence of these older star phylogenies. In The Horse, the Wheel, and Language, David Anthony argues that mobile populations domesticated the horse, and used that as a killer cultural advantage to spread their Indo-European language. In his book from the 2000s Anthony argues for elite transmission of language by the Kurgan people. But more recently he has been persuaded by genetic work which suggests massive population displacements and migrations into Europe during the late Neolithic and early Bronze Age. Unfortunately the timing doesn’t work from what I can tell. The expansion of groups like the Corded Ware seem to pre-date the emergence of the steppe chariot toolkit by many centuries. It does so happen that the chariot was invented in the region where R1a1a2b-Z93 was also found to exist. So I suspect this “Scythian” R1a lineage did sweep across much of Central-South Eurasia thanks to the horse and the wheel. But a technological explanation is more difficult for the rest. I will posit another speculative answer, stealing the idea from Snorri Sturluson. He believed that the gods that were remembered by his pagan Norse ancestors were at one point men of great renown and fame. Kings of yore. Over time they had been deified, and legends had grown up around them. Sturluson may have been right. Perhaps the Indo-European gods recollect the forefathres of R1a and R1b. What was there advantage? Perhaps it was a hierarchical stratified social structure which brooked no individualism against the interests of the lineage unit? It may be that asabiyya is worth more than a chariot? Nevertheless, the rapid expansion of R1b (and possibly I1) in Europe contrasts with the less starlike expansion of E1b1a in Africa, which has been associated with the spread of farming, ironworking and Bantu languages in Africa over the last 5,000 years (Berniell-Lee et al. 2009). Both R1b and E1b1a samples are from a mixture of indigenous donors (from Europe and Africa, respectively) and admixed American donors, so sampling strategy does not provide an obvious explanation for the difference. Instead, the different phylogenetic structure, with far more resolution of the individual E1a1a branches, may reflect expansion starting from a larger and more diverse population, and thus retaining more ancestral diversity. Over at Dienekes blog he has a post up about the extraction of R1b from a male who lived in Germany 4-5,000 in the past. This is important because R1b is one of the two most common male lineages (on the Y chromosome, passed from father to son) in Europe, and, it has inexplicably been underrepresented or absent in the ancient DNA samples. The other modal lineage is R1a (it too is underrepresented). I have a pretty good grasp of variation on the autosomal dimension. A modest familiarity with uniparental lineages, Y and mtDNA. And finally, a rather weak understanding of archaeological patterns. Since mtDNA tends to be found at very high concentrations in subfossil remains you’ll get a good yield of that in the near future (as in the paper Dienekes covers). Y chromosomal information is more difficult. The problem with autosomal information is that you need more of it to make robust genealogical inferences (due to confounding with selection, as well as recombination breaking apart haplotypes), though if you manage to hit a functional region that can be very informative.